Calculating F:M ratio is a great tool for wastewater operators to make sure their bacteria population is being given the conditions needed for success. However many plants struggle with a low F:M Ratio. Having a low F:M ratio, means you have too many bacteria in your wastewater system relative to the incoming Biochemical Oxygen Demand (BOD). This causes starvation of healthy floc forming bacteria, and issues such as bulking, or high effluent Total Suspended Solids (TSS). Low F:M conditions also favor the growth of filamentous bacteria Type 1851, and Type 0041/0675. Type 1851 in particular often cause bulking issues in wastewater treatment systems. The activate sludge calculator below can help to determine the F:M ratio of your system, and to determine the impact of adjusting variables in the equation. After calculating the F:M ratio of your wastewater plant, please see what the impact is if you change the MLSS concentration up and down. MLSS is one of the few variables that most treatment plant operators are able to control that impacts their plants F:M ratio. Typically, low F:M conditions can show up in two ways. Chronic underloading is a common problem in small municipal plants and is difficult to deal with. The easiest way to deal with this is increasing sludge hauling when possible. The other is intermittent low loading which generally requires a food supplement during low loading periods. Keep in mind, since bacteria operate faster at warmer temperatures, often a plant can become underloading during the summer when temperatures increase, even if it operates well during other times of the year. 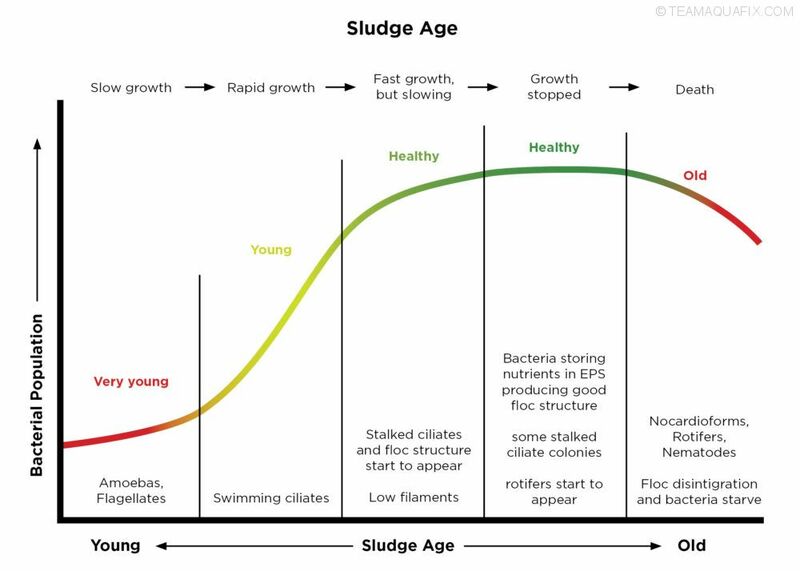 Low F:M tends to correspond with high sludge age conditions (and high F:M tends to correspond with low sludge age conditions) because low F:M tends to lead to cell death due to starvation. When bacteria run low on food, they produce glue-like compounds known as extracellular polymeric substances (EPS). This serves as a method to store and concentrate BOD, in close proximity to floc forming bacteria. This is generally a beneficial process as flocculation is required for a clear effluent. Once Bacteria have been low on food for an extended period of time however, they begin to degrade the EPS as food, which begins to cause floc disintegration. This leads to a cloudy supernatant. Another interesting problem that is related to low F:M is foaming, caused by Nocardioforms. Nocardioforms typically exist in high sludge age conditions which often corresponds to low F:M. In addition, Nocardioforms are extremely efficient at removing BOD. If Nocardioforms are thriving, they can cause low F:M conditions and the growth of low F:M filaments in wastewater systems, that have a healthy F:M ratio, by stealing the food which is required by floc formers. In such cases, controlling Nocardioforms can often alleviate the low F:M symptoms. The F:M ratio in most wastewater systems can be controlled two ways. The first method is increasing wasting in your wastewater system to reduce Mixed Liquor Volatile Suspended Solids (MLVSS) levels. This can often be difficult and impractical in low loading systems; therefore, alternative methods are often required. Often wastewater systems will add cheap feed such as dog food to attempt to improve these conditions, but these feeds often contain high levels of grease which can cause Nocardioform foaming, and high levels of solids, which can build up and reduce aeration basin volume. Aquafix offers SmartBOD as an alternative to feeds like dog food. SmartBOD contains less grease and is mostly soluble eliminating problems observed with dog food. In addition, SmartBOD contains much more concentrated BOD and nutrients than dog food meaning application is easier (less lifting), and SmartBOD has been specifically formulated to improve floc formation leading to clearer effluent. For Questions about activated sludge, Low F:M conditions and SmartBOD, feel free to contact Aquafix!